Have you ever given or received Cupcake gifts? Cupcake gifts are presents that are inspired by, or involve, cupcakes. One of my favorites is a cupcake bouquet . This is a fun gift to make and the results are so impressive. Another gorgeous cupcake gift involves the recipient making their own cupcakes but you give them the ingredients. 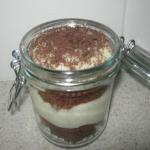 You can either put the dry ingredients in a jar or you can put them in the tin. If you put the ingredients in the tin, you can also add the eggs and/or butter. The tin then becomes a really useful storage container to keep the cupcakes in. If you give cupcake ingredients make sure that you also give the recipe. I have found some cute cupcake cards and these are ideal for writing the baking instructions on. 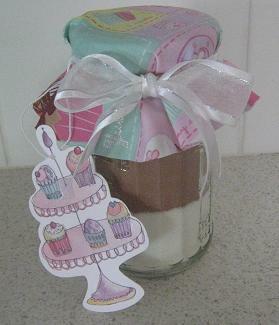 Sometimes you want to give a gift but know that the person will not bother baking so give them some cupcakes in a jar. I have made chocolate cupcakes and either layered them with buttercream frosting or whipped cream. I f you are looking for a present to take to a baby shower make some flannel cupcakes. My daughter made a cupcake mosaic. This would be a beautiful gift to take to a special friend. Elizabeth also painted a cupcake painting which now proudly hangs on our wall. Share your cupcake gift ideas - it's easy! Have you ever received a beautiful cupake gift? Have you made the items featured in the website and want to share your finished product? We would love you to send in some photos and share your stories.